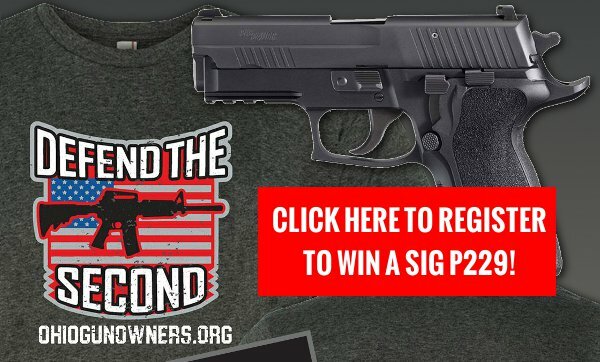 Win a Sig P229 from Ohio Gun Owners! And gun-grabbers and their pals in the media believe they’re finally set to “cash in” on the pure political poison they’ve been flooding our airwaves with ever since the results of the 2016 elections poured in. They believe the political winds have changed. They know the media is in their back pocket. They know Governor Kasich’s anti-gun insanity succeeded in derailing our efforts to pass pro-gun bills before the summer recess. All of this has gun-grabbers here in Ohio licking their chops – convinced that it will mean big gains in our State Legislature this fall and a Lame Duck session (after the November elections) chock full of gun control fights. Will you please click and submit your pledge to me at once? If you do so, your name will be entered to win a Sig Sauer P229 on September 18, 2018. This is the gun the Secret Service uses to protect President Trump from the hordes of violent anti-gun leftists who are now taking their orders from anti-gun California Congressman Maxine Waters, Michael Bloomberg and George Soros. This is the first time Ohio Gun Owners has ever conducted a pistol giveaway like this. I’m doing so now because I need to generate as much opposition to gun control in the State Legislature as possible and FAST. Knowing Ohio is a key to their goal of DEFEATING President Trump in 2020, BILLIONAIRE anti-gun activist Michael Bloomberg is ready to UNLOAD in Ohio. *** SO-CALLED “RED FLAG” GUN CONFISCATION ORDERS. This would allow government officials to SEIZE your guns – just because some “friend” or family member complained about you. That could be just because some crazy aunt doesn’t like the sticker on your vehicle or the post you made on Facebook! *** BANNING HIGH CAPACITY MAGAZINES, AR-15’S AND OTHER SO-CALLED “ASSAULT WEAPONS.” If the Gun Control Lobby gets their way, 30 round magazines, bump stocks, and any firearm the gun-grabbers think looks “scary” – whether it’s a handgun, shotgun or rifle -will be banned! *** SO-CALLED “UNIVERSAL BACKGROUND CHECKS.” This is nothing more than code for STATEWIDE GUN REGISTRATION. The only way such a scheme can be enforced is by keeping track of every gun and gun owner in the state! And as you and I know, registration is just the first step toward outright CONFISCATION! My hope is that you’ll agree to $75 or $50. Or, if that’s too much, please just give whatever you can afford. Web, you’re a critical part of Ohio Gun Owners’ winning team. But there’s more at stake in Ohio this year than ever before. So please sign and return your Pledge and agree to a generous contribution of $75, $50 or whatever you can afford today! P.S. Will you please click and submit your Second Amendment Turnout Pledge? If you do so, your name will be entered to win a special Sig Sauer P229 on September 18, 2018 – the gun the Secret Service uses to protect President Trump from the hordes of violent anti-gun leftists – like the one who tried to shoot up the President’s Miami golf resort! And if at all possible, please agree to a generous contribution of $75, $50 or at least $25 right away!